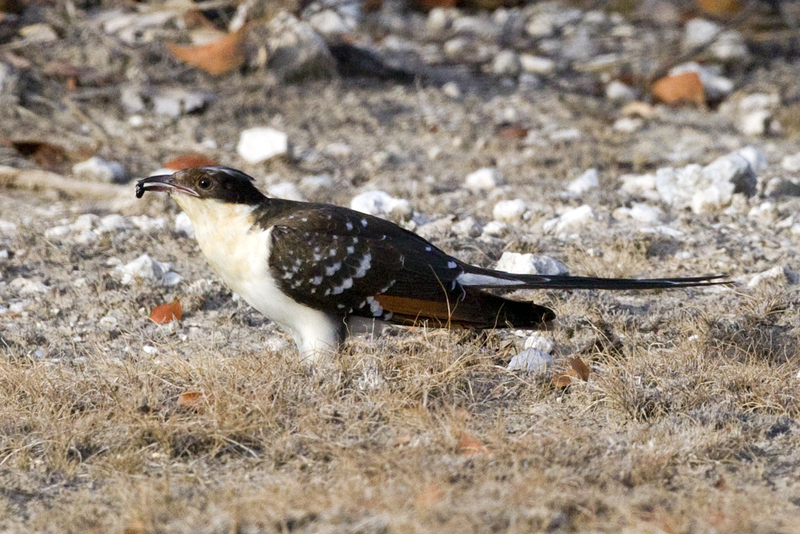 The Greater Spotted Cuckoo (Clamator glandarius) uses a ‘mafia‘ strategy in its relationship as a brood parasite with the magpie (Pica pica). This parasite/host strategy involves the destruction of nest and eggs/chicks of a magpie found to have ejected the cuckoo’s eggs from its nest. The victims appear to ‘learn‘ from this bird bullying behaviour. Cuckoos are not necessarily the nicest of neighbours, especially if you are ‘selected’ by them to be a beneficiary of their protection racket! You are probably familiar with the fact that unlike most birds cuckoos do not like to bother themselves with building nests, hatching their eggs and feeding their offspring. What many people do not appreciate is that some cuckoos actually go around trashing the nests of other birds who don’t subscribe to their ‘protection’ services. Cuckoos are what are known as brood parasites – they lay their eggs in the nests of other birds and expect the new ‘foster parents‘ to keep the cuckoo egg nice and warm, with their own eggs, until it hatches. Once the ‘adopted’ cuckoo chick is born the foster parent is then expected to care of it and feed it as it would its own chick until the young cuckoo is ready to fly off and perpetuate the cycle by finding another unsuspecting foster family for its own offspring. Evolution is not a big fan of species which expend precious energy in helping the genes of other unrelated species to multiply and flourish with little, if anything, in return for their own offspring. 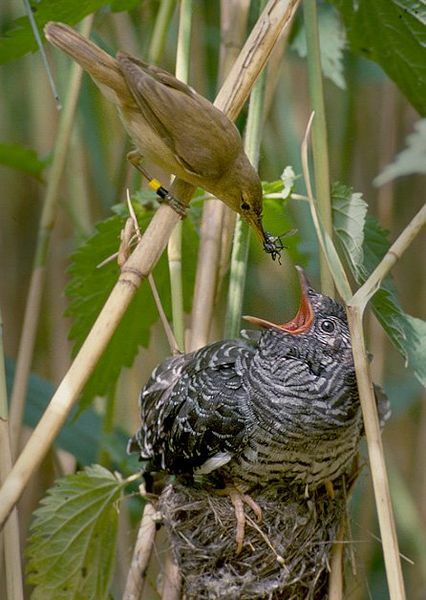 As a result potential victims of cuckoos have evolved numerous ways to avoid becoming involuntary foster parents. Sadly birds are not renowned for their mathematical skills, otherwise they might simply count the eggs in their nest to see if the number had unexpectedly increased while they were out shopping for some worms for breakfast. To counter these weak mathematical skills many birds have developed characteristic markings on their eggs so they can spot a foreign egg which suddenly appears in the nest. They can then eject these imposter eggs over the side. In response the cuckoos who use these species for brooding purposes have evolved eggs which are identical in appearance to their chosen foster parents. However, this means that the cuckoo is restricted to always using the same host species since the egg markings are species specific (this is one of the explanations why birds have developed such a wide variety of different species-specific egg markings and colours). Some birds, like swallows, have even evolved so that their chicks are able to recognise a ‘foreign’ egg in the nest as soon as they hatch. One of the chick’s first activities after hatching is to push the unwanted foreign egg up the side of the nest by cupping its baby wing stubs to form a simple basket. As the chick moves backwards it pushes the egg up the side of the nest until it eventually topples over and hey presto – “Goodbye cuckoo egg!” (As a result you don’t find many cuckoo chicks being raised by swallows – if you are interested in reading more about such evolutionary developments you might like to take a look at Richard Dawkin’s book ‘The Selfish Gene‘ – The Swallow’s defence against unwanted cuckoo eggs is described on page 134). To counter the evolution of such defensive mechanisms in potential foster parent species some cuckoos like the greater spotted cuckoo have adopted a rather sinister ‘host encouragement‘ strategy. If you own a restaurant which is forced by the local Mafia to pay protection money to avoid being trashed by their ‘boys’ this strategy will be quite familiar to you. In fact perhaps instead of being called “Clamator glandarius” perhaps the great spotted cuckoo should be renamed “Clamator cosanostra“. If a greater spotted cuckoo egg gets ejected from a magpie (Pica pica) nest the cuckoo pays a visit to the nest and simply ‘lays it to waste‘. It destroys the nest with any contents – including eggs or chicks of the nest’s rightful owner. It would appear that the cuckoo’s strategy is designed to teach the bird a lesson – “if you don’t look after my chick then say adiós to your home and your own loved ones“. In evolutionary terms this means that hosts which do not look after the cuckoo’s offspring do not get to have any kids of their own – as a result only birds possessing genes allowing them to learn and adapt to the cuckoo’s ‘host encouragement‘ strategy are able to survive and multiply. In addition to bringing up the cuckoo’s chick they are also ‘allowed’ by the cuckoo to rear their own offspring. The evolutionary robustness of the cuckoo’s mafia strategy has been put to the test using sophisticated mathematical modelling techniques to confirm that a stable evolutionary situation can develop in which both cuckoo and the receptive foster parents thrive. If you are interested in reading more about this modelling the original paper by Maria Abou Chakra, Christian Hilbe & Arne Traulsen of the Max Planck Institute can be found in the scientific journal Nature.com here. (Plastic behaviours in hosts promote the emergence of retaliatory parasites). This modelling does indeed demonstrate that a successful balance between host (the magpie) and parasite (the cuckoo) can evolve: both can co-exist due to the host’s ability to ‘learn’ following an early experience of nest wasting by the cuckoo. The advantage for the cuckoo is that it does not have to expend energy in complex species-specific methods to protect it’s eggs like making them look like (or mimic) the eggs of a host. Such mechanisms mean the cuckoo must always deposit its eggs with the same species (since the egg markings are species specific). The Mafia strategy allows the cuckoo to lay its eggs in the nest of any species which is receptive to ‘learning’ through bullying. The advantage for the host is that although it has to expend additional energy looking after a greater spotted cuckoo’s chicks the survival of its own offspring is more likely. The cuckoo has a vested interest in helping the host to protect the nest from any unwanted prey. In addition it is known that the chicks of other cuckoo species have evolved other unpleasant ways to ensuring their preferential survival in a foreign brood. They have a very short incubation period which allows them to hatch before the eggs of their host. Upon hatching, despite being blind, the first activity of these cuckoo chicks is to toss the unhatched eggs of their host out of the nest. Faced with such evolutionary infanticide the Mafia relationship at least allows the host chicks a reasonable chance of survival (as long as the foster Mummy looks after the cuckoo chicks like her own). So whenever you hear that familiar sound of the cuckoo in the forests this spring it is worth remembering that this may well be a warning to any other birds in the vicinity: “this is my territory and if I lay an egg in your nest you had better look after it – otherwise its curtains for your home and family“. Sometimes the sweet sounds of nature can have some very sinister undertones.